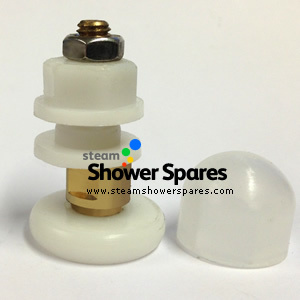 Pack of 2 Shower Door Cam Wheels. The brass centre is offset from the centre to allow you to use it to adjust the height of the doors when levelling. These are compatible with simillar wheels that are either black or beige. Why not UPGRADE to Twin Wheels Cams ! An alternative to this item is this shower door cam pictured to the left. These cam wheels are a higher quality, heavier duty cam and can be retro fitted with a small adjustment needed to the door stops to enable the doors to open and close fully. These cams also have quick release buttons fitted to the lower door cams to enable easy cleaning of the shower doors.